Fire Emblem: Seisen no Keifu (ファイアーエムブレム　聖戦の系譜, Faiā Emuburemu Seisen no Keifu?, literally Fire Emblem: Genealogy of the Holy War) is a Japanese Super Famicom tactical role-playing game developed by Intelligent Systems and published by Nintendo. It was released on May 14, 1996 in Japan. 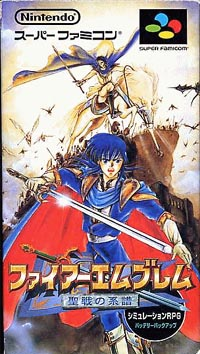 It is the fourth title in the Fire Emblem series, the second Fire Emblem title for the Super Famicom and was the last game produced by Gunpei Yokoi. The game has received recognition outside Japan through imports and console emulation. This page was last edited on 3 July 2013, at 00:09.